It’s all been a bit manic the past week, getting back into your multi-role job of lunchbox-maker, school-taxi-driver, after-school-entertainer and tell-bedtime-stories-for-40-minutes-trying-to-escaper… Us Mums will take any help we can get to make life easier, so take your pick of these fun, Fall, family things to do after school that will keep the kids quiet. Depending on how tired your tots are, either go for a walk or ponder your garden and collect any autumn leaves, acorns and conkers you find and use them to make all sorts of pretty things! Kids love getting creative. Check out our Pinterest board on autumn arts and crafts here. Some kids countdown to Halloween (and us Mums too!) and if yours are the type who love to get into the spooky spirit, a bit of trick or treat baking is a perfect after-school activity. 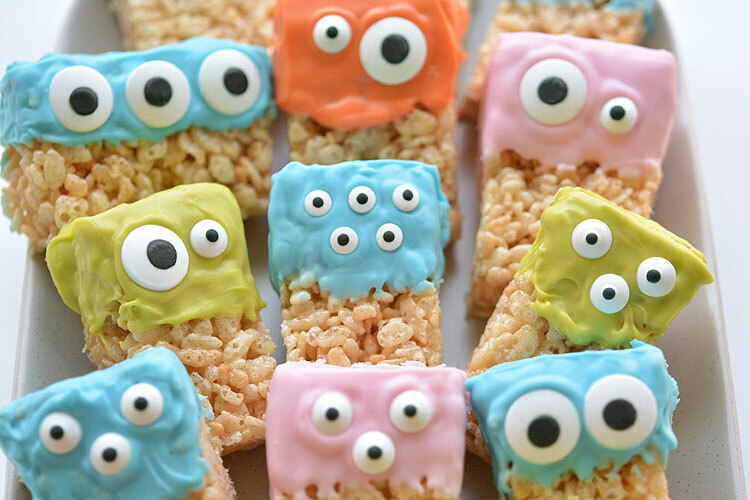 Try out these Rice Krispie Treat monsters which you can use afterwards as lunchbox fillers! Tell your little ones that the leaves are falling and all the fairies need to keep warm! Your little ones will love nosing around the garden for sticks, leaves, acorns and pebbles to make cosy houses in the soil for the fairies. When your kids come out of school all giddy and hyper you can always count on a Play Centre to let them blow off some steam. Exercise in disguise, play centres offer an ideal place to let the kids run around and just have fun, whilst you get to have a sit down and a coffee whilst you watch over them! Half the price of your soft play trip, find out here what discounts you can get at your local play centre with Kids Pass. Maybe it’s nearing the end of the week and you’re a little exhausted, if so save on the washing up and when all the kids and dad are home, head to your favourite local restaurant where you can enjoy a bite to eat and maybe a glass or two! Find out what restaurant discounts you can get with your Kids Pass here. This arty idea works as a double whammy: an after-school activity and a Christmas gift making session all in one! Buy some basic wooden photo frames at the weekend then help your little one to decorate them with paint, glitter and anything else you dig out of the arts and crafts box! After a long week, if your kids have been well behaved, take them to the cinema to see the film of their choice! (Maybe not IT…) If you’ve already taken them to see Despicable Me 3, Cars 3 or The Emoji Movie, why not take them to see The Jungle Bunch or Animal Crackers which are both in cinemas this Friday 15th September! Don't forget to use your Kids Pass and save up to 40% on your adult and child tickets, popcorn and drinks!